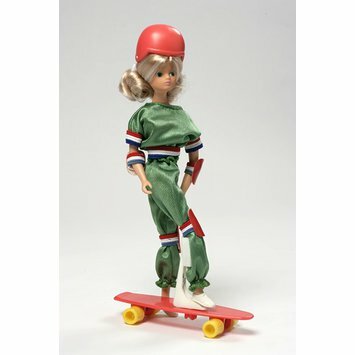 Teenage doll wearing a skateboarding outfit, accessorised with a skateboard. The doll is made from soft PVC, with a flange head set on the ball of the neck, with rooted nylon blonde hair and painted blue eyes. The body is jointed at the hips, shoulders and waist and strung with elastic. The limbs are flexible and can be positioned. 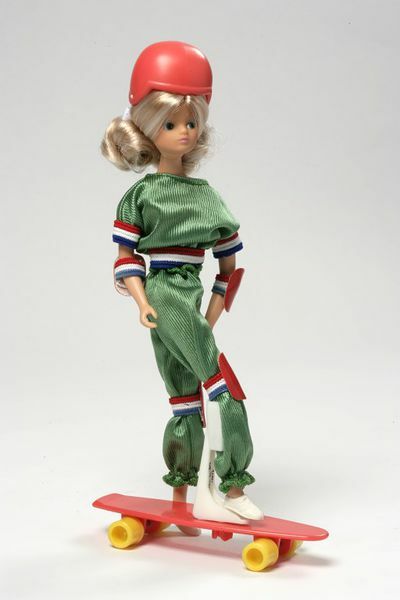 The doll is dressed in a green polyester outfit, trimmed with red, white and blue. There are white PVC knee and elbow pads, white PVC shoes, and a red and white plastic helmet. The skateboard is red and yellow plastic. The display box gives the title of the doll, and a description. Also with it are three printed paper booklets: 'Daisy: read about my gift shop'; 'Daisy: my exciting life as a reporter in fashion by Mary Quant'; and a free doll offer. Given to the Museum in 1979 by Mary Quant as part of a larger gift (see MISC.86 to 96-1979). The clothing in this gift were among the first pieces of contemporary children’s clothing acquired after the Bethnal Green Museum became the Museum of Childhood in 1974.